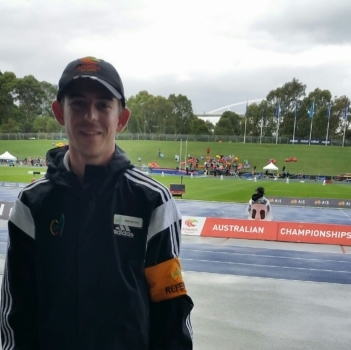 Matthew Vine (Class of 2008) has been appointed to the 2018 Gold Coast Commonwealth Games as a Technical Official – Field Judge for Athletics. Starting as a local Little Athletics (Mindarie Club and Ridgewood Centre) volunteer in 2013, Matthew has worked his way up the ranks to national and now international competitions. In 2013, Matthew started by helping at his local club and centre where brother’s Carl (Class of 2015) and Ryan (current PMACS student) competed. Matthew was seen by local officials who were providing education and training for officials and invited him to attend senior competitions. Four seasons later, Matthew is now regularly appointed to National Championships as a Field Judge and Chief Field Judge, as well as being appointed as a Referee or Chief Judge at State Championships for Little Athletics WA and Athletics WA. Matthew also officiated at the 2016 World Masters Athletics Championships in Perth and is heading to New Zealand in January to officiate at the 2018 Oceania Masters Athletics Championships in Dunedin. The 2017/18 Athletics Season is jammed pack for Matthew with preparation for the Commonwealth Games in April. Matthew said he was extremely excited and honoured to have been appointed to the Games. There were over 300 applicants with just 180 appointed as Technical Officials. He never expected to be officiating at such a high calibre event and is going to enjoy every moment of the experience. The PMACS Alumni would like to congratulate Matthew on his appointment and wish him all the best for the competition. The 2018 Gold Coast Commonwealth Games will be broadcast on Channel 7 between 4th and 15th April, with Athletics featuring between 8th and 15th April.